Easylinehost Review 2019: Is Easylinehost a Good Hosting? Finnish company Easylinehost offers a range of customizable and upgradeable hosting solutions at competitive prices to global clients. Easylinehost is based in Kuopio, Finland. It offers web hosting services, virtual servers, server rental, and domain name registration along with remote monitoring, backup services, and e-commerce solutions. This vendor’s website is in Finnish and English, with some support areas also available in Swedish. Easylinehost’s web hosting plans come with no setup fees. You can choose from five plans – Easy, Silver, Gold, Platinum, and Titanium – with the ability to upgrade your plan easily as your business grows. Hosting plan resources include 250 MB disk space, one email inbox, and no traffic restrictions. You get access to a user-friendly control panel (to manage your domain) and automatic daily backups (via the DataInSafe remote backup and monitoring service). And you can access email via webmail or via another email client– with or without SSL encryption. For e-commerce customers, Easylinehost offers “web store solutions” that combine web hosting with shopping cart and order management services. Easylinehost’s web hosting plans are competitively priced compared with the industry average. However, there is no trial period and no money-back guarantee. You can pay for plans semi-annually, annually, or biennially in either U.S. dollars or euros. 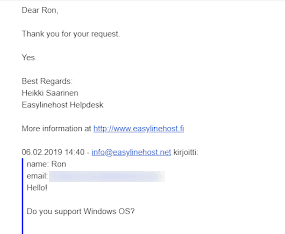 The quickest way to reach Easylinehost’s support staff is via live chat during Finnish working hours. But beware that you might have to wait your turn at busy times. Emails can be sent to specific addresses (for billing, helpdesk, feedback, and customer service), and there is also an online form. When I submitted a query using the web form, I received a reply within twelve minutes. Signed-up customers can sign in and raise a ticket, and while the website shows a telephone number, this company encourages customers not to call. In terms of self-help resources, there is a Finnish-language FAQ page that resets to the company’s home page when you try to switch it into English. If you can read Finnish, or you let your browser take care of the translations, you might find some useful information here. For those looking for high-quality, customizable web hosting at competitive prices, Easylinehost doesn’t disappoint. Wondering how Easylinehost stacks up against other Web Hosting companies? Enter any other Web Hosting company and we will give you a side-by-side comparison.